Writing a cake book really is one of those things that is on the list of many cakers I have met. In fact, almost all cakers have this secret hidden dream. And why the hell not? 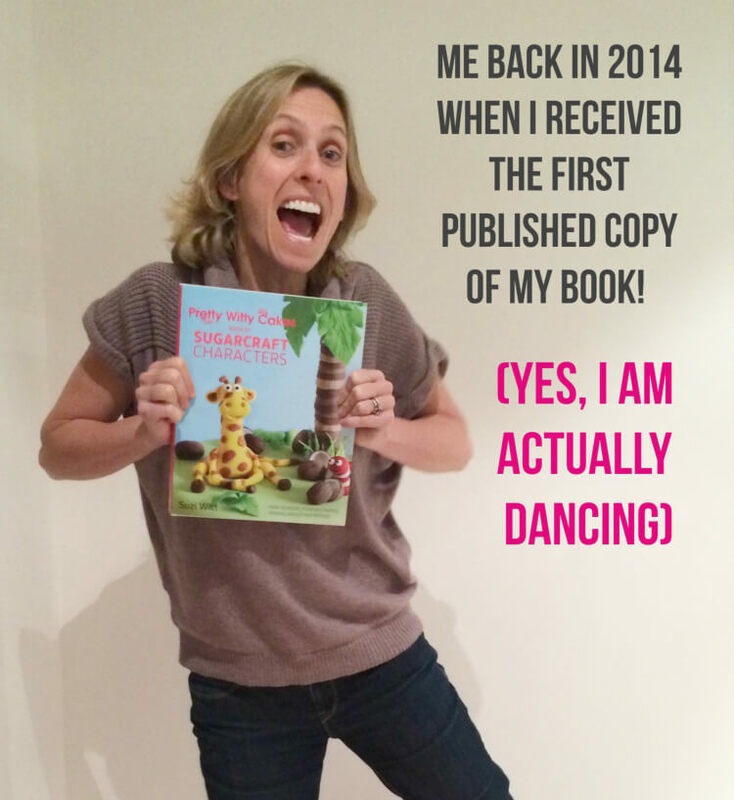 Having your own book is often a bucket list dream that you can totally make a reality. Indeed, on the Amazon book charts there are 1000s of cake and baking books ranging from famous TV chefs to friends of mine who are also published authors. I wrote my first cake decorating book back in 2013 (published in 2014). It went to the No.1 slot on the Amazon Best Seller List and it enabled me to reach a wide and global audience. Indeed, for a long time, the most common posts about me were connected to that book. For me, however, writing a cake book was more than the payment and the creative side. It was the many many emails, personal letters, and thank you cards that I received. It was the personal connections I made with the recipients of the book that made it so special. Those are what I think of when I think about my own book. Inside the Pretty Witty Academy, I have a full course giving all the details of how I got a book deal, the secrets to getting a foot in the door and the one thing you need to do to ensure you dramatically increase your chances of getting a YES from a publisher. Tip #1. Think about why you are writing a book? And of these, authority is the most important. You will find it much easier to get a book deal if you have established yourself as well known in your niche and have an interested audience. Getting a book deal is not for the easily deflated. You will probably get knock backs but tell me a great author who didn’t. We all know the story of how JK Rowling had her manuscript rejected 12 times before being accepted. Twilight was rejected 14 times. Dr Seuss was rejected 27 times! And yet they all went on to be top selling books. So, if you are looking to get a book deal, persistence and the ability to deal with initial rejection are just part of the package. Get your mindset set for that so you are ready to pick yourself back up if you are initially rejected. 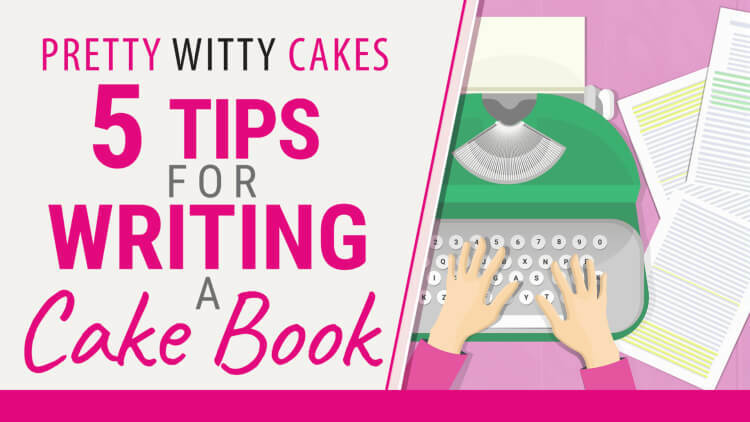 OK – Writing a cake book is not a quick thing you can knock up in a month or so. For me, writing a cake book was one of the most time consuming “jobs” I have ever done. It was relentless work back to back that almost took over my entire life, and the remainder of my business at one point. Unlike filming or teaching face to face classes, everything about writing a book takes a loooonnnnnngggg time. It's not hard to do (you are a cake artist after all). But, you HAVE to plan everything on paper so your pitch is clear and well thought out. If you get a deal you will work on a pre-book (called a Blad) which is a mini mock-up to be used by your publishers in their sales pitches showing what is coming to the book industry. This helps them to get some advanced potential sales for your up and coming title. You will need to make all of the cakes in the book and probably more than once in some cases. With modelling books (like the one I did) you may end up making the individual characters multiple times. By multiple, I mean about 15 times! In my book, I really pushed for a detailed step by step book that would be so user-friendly and helpful. That meant photographing lots of step by steps. So we had team of 4, sometimes 5 working on all the photo shoots at any one time. It was a big undertaking that would see days run from 8am to 11pm sometimes to try and meet deadlines. And deadlines are huge in the publishing industry. Your publisher will be seeking to meet their deadlines for publication and this will put you under pressure to deliver. This is all totally achievable so don't be put off. But if you are the kind of person who does not work well under pressure, you need to think about this and forward plan as much as you can. In the back of my mind I had always hoped to get a book deal, but I had taken no steps to make anything happen. I was very lucky because my agent actually contacted me. She had seen me online and seem my social media profile and she offered to be my agent. To be honest, I was flattered and had no idea what to say at the time (other than yes!). What I didn’t know then is how much Jane, my agent would help me. She would give me guidance, steer me in the right direction and help with difficult questions that came up over the contracts and marketing of the book. She was a person on my team and I was so grateful she was there. Writing a cake book without an agent can be a much tougher mountain to climb. Agents are very well connected and know a lot of people in the industry. That will mean they can open doors for you. In my case, because Jane is so awesome at what she does, she got me several meetings with publishers. Granted I was left to do a lot of the talking in those meetings but without Jane, I would not have even know where to start or whom to contact to get the meetings in the first place. I ended up with 3 offers from 3 different publishers for my book. Again, it was Jane who was there helping me when I had to pick the one that best suited me and what I wanted to do going forward. If you are a big TV chef, you can probably write a book about almost anything things and it will (probably) sell. If you have a huge social media following the same is true. But for everyone else, the old saying about the riches being in the niches holds true. Thinking about a niche where you have the skills to fill a hole. Is there a part of the baking world where you can bring something extra? Are your followers asking you for a book? Are you keen to focus on a specific area? Whay makes that different to all other books? This is important because if you can create a book that has a wide appeal without a target group of buyers and you can demonstrate they will potentially buy, all you then need to do is match that to a publisher looking to fill the whole in that market. That is much easier than pitching “another” generalised cake or baking book. Now, there are heaps more tips I could give and the multi-part video course in the Pretty Witty Academy goes into huge detail on all aspects of getting a book deal. If you want to see more about the Academy, look here. Inside the Pretty Witty Academy, I tell you all the secrets of how I got a 5-figure advance for my own book deal and how it went to No.1 on the Amazon best sellers lists. We all think of the famous authors who were poor one minute but rich the next. But that is often media hype or so rare. In fact they usually spent years perfecting their work or were rejected multiple times before they got the big break. Be realistic about getting a book deal. It is something you can work on alongside making your cakes and building a cake business, a brand and other aspects of your business. But don’t make it the only thing you are doing. That would leave you putting too many eggs in one basket. Bonus #2: Pay Varies - a LOT! In my case I got paid a very large 5 figure sum for my advance for my book. But other cake artists I know have been offered a low 4 figure some or even 3 figures for an advance. You need to be realistic here as well. If you are relatively unknown but highly skilled, you may well get a book deal but you may have to accept a very low advance. If you get one successful book under your belt you can then increase your price for a later book once you have a proven track record. If you are better known with a large social media presence, you are more equiped to help your publisher get good sales so you may then command a better advance. The key is to be realistic. I discuss what I got paid and the different ways of being paid in more detail in the Book Course inside the Pretty Witty Academy. Rose Macefield is a great cake artist friend of mine and a tutor at the Pretty Witty Academy. 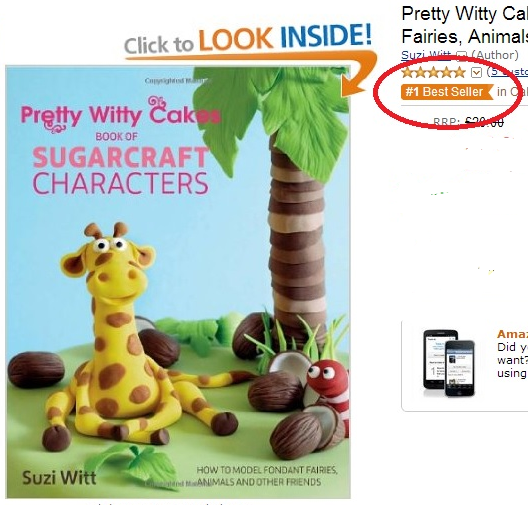 So this review tells me (and Rose) that carved novelty cakes are popular book topics for some people. This lady probably didn't realise when buying the book that my book was a carved topper book whereas Rose Macefield does full novelty cakes. The point however, is that, this then led to me being contaced by a publisher asking if I would be interested in doing a book on bigger cakes. You see - reviews and public opinions, good and bad, can help you when you are researching as they help reveal what the audience are interested in. If you have a good idea and great caking skills, you are likely to get a deal once you get in front of the right people. But those people are not just gonna turn up at your front door so you also have to start working hard to get your name out there showing what you do. If you are a bit slack on social media, its time to up your game as having lots of imagery of what you do with lots of likes is only a good thing when it comes to persuading a publisher that you are a safe risk. Take chances, get involved in collaborations to show off your work and start getting your name out there! Apply to be a tutor at Pretty Witty Academy - that is an awesome way to get well known as many tutors have found :). If you are wanting to get a cake book deal, it is all in the planning. Research your niche, your idea and how your book will stand out and really sell. Then plan it and look for an agent to guide you to the publishing house door. And remember, if you get rejected initially, tweak things, get feedback and then start over because unless you have tried at least as many times as JK Rowling (12 times), you just haven’t tried enough….